2 Beds 2 / 2 Baths 2 Partial Baths 1,720 Sq. ft. Description: Open sunday, january 27th from 1-3 pm! 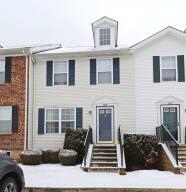 Spacious, move-in ready townhouse condo with 3 finished levels of living space. Attractive exterior with reserved parking space in front plus a single car garage just across from the unit. The main level offers an expansive great room which is open to the kitchen with dinette space. The kitchen features wood laminate flooring, stainless steel appl, walk-in pantry & sliding glass door to the deck overlooking a picturesque pond. The upper level offers 2 generous br suites, each with 2 closets (walk-in & regular) & private, ensuite baths. Large, lower level family room with gas fireplace is a cozy retreat, great for entertaining. Basement area with storage & laundry hookups. Community pool. Close to shopping, i-70 & 270. Immaculate & move-in ready!